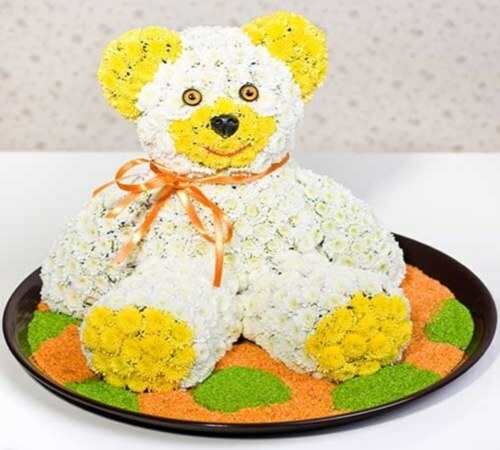 In recent years, very popular original shapes of flowers, they often give adults and children are bought as corporate gifts to business partners and leaders. Making shapes of flowers requires a lot of experience and careful observance of technology, complex compositions florists create for hours. However, to make a small figures of flowers in the form of animals is quite simple. - a tray or basket. Prepare the materials. Take a small spray chrysanthemum, you will need about 30 flowers. The chosen figure determines the color, size and variety of colors, for example, for a rabbit or Swan use white chrysanthemums, and for fish and chicken yellow. Take a few bricks of oasis floral quality and cut of them desired shape. Separately cut the legs, torso and head. Very carefully apply on the head and face. Try to make the figure as similar to the selected animal, because after the flowers decoration, she may lose expressive features and become more blurred. The finished part for a few seconds, dip it in the water and connect with skewers and tape. Since water can flow from the oasis, put the composition on a tray or in a basket with the bottom. Note that the figures from oasis is quite heavy, so do not make too large volume of the composition. Cut the flower stems to a length of 10 mm and leave it for a while in water so they are saturated with water and has got a fresh look. Then, tightly insert the flowers into the body of the oasis so that it completely close. Work carefully and thoroughly, this will depend largely on the appearance of the composition. If possible, make a face, palms and soles of the feet, the inner part of the ears flowers of other colors. Decorate the face with beautiful eyes. The eyes give the figure of the animal expressiveness, so pre-buy them at a baby store or make manually. If you want to give the animal the originality, draw the eye colors and glue tape. So the eyes can be shaped in any form and expression. This pattern of flowers will last at least 10 to 14 days, but if you want to prolong its life, then watering every day, the composition thus able to preserve the beauty and freshness for about a month.